Millennium 7 Publishing Co.: Social Media Startup Mistakes YOU Can Avoid? Social Media Startup Mistakes YOU Can Avoid? 15 mistakes startups make on social media that yours can easily sidestep..
Too many platforms being used? Lack of visuals? Misuse of hashtags? No social media manager? The list goes on.. If you're a new business owner, you likely know all too well that establishing a strong social media presence is a must. Like any marketing tool, however, social media is useful only when it's used effectively. Just posting a cute picture of your cat with your brand logo up in the corner won't cut it. So, if you recognize yourself here -- and are vowing to make your social media work (better) for you -- here are 15 social media mistakes and how to avoid them. Every startup needs a business plan, and your plan for using social media needs to be part of it. The key to setting goals for social media is identifying your target customers, then determining where to find them. If your demographic is women, look to Pinterest, but if you're aiming for customers under 25, check out Snapchat. Having a target helps only if you measure how well you're hitting it. With tools like Facebook Insights and Twitter Analytics, you can track how customers reacted to specific posts, how often your brand is mentioned, which demographics responded most favorably and much more. It's easy to get caught up in the excitement of launching your brand, and join every site available. However, trying to juggle Facebook, Twitter, Google+, LinkedIn, Instagram, Pinterest, Snapchat, and a partridge in a pear tree will lead only to burnout. Start with just a couple of platforms and post regularly. Copying and pasting is for spammers, not entrepreneurs. Another reason to start small is so that you can adapt and optimize your content to the conventions of each platform. Reading a press release about your new product through Twitter and then seeing a photo of it on Instagram will keep customers engaged on multiple levels. You may do your best work at 2 a.m., but that doesn't mean your customers will be awake to read it. Make sure you are posting when your base is online. According to Buffer Social, Facebook engagement rates are highest on Thursdays and Fridays and hit a weekly low on Saturdays, whereas click-through rates on Twitter peak on the weekend. The good things you have to say about your startup could fill an encyclopedia, but on social media, less is more. Facebook posts with 250 characters or less get 66 percent more engagement, and although all tweets are necessarily short, those with 100 characters or less still get 17 percent more engagement (again, according to Buffer Social). Hashtags help cut down on characters and craft targeted exposure for your brand, but only if they are used strategically. Tweets with hashtags have double the engagement, but engagement drops when more than two hashtags are used. Photo captions crammed with hashtags are less likely to be read. The impact of visual marketing is well established. Tweets with images are retweeted 150 percent more often, and Facebook posts with images get 2.3 times more engagement than their text-only counterparts. Blurry photos and a lot of stock footage will make your business appear amateurish. Instead, up your game with high quality images, infographics and videos. On sites like Instagram, your bio is the first thing potential customers see. Successful businesses combine necessary information with creative flair to make their brands stand out. Describe the values behind your company in a few brief words, show the human side of your business with photos of your team or even use emojis to demonstrate how to use your product. Every business gets occasional complaints, but when a customer posts an angry rant to social media, the rest of your customers are there watching how you handle it. Always respond to complaints promptly and in a professional manner. Ignoring the complaint, deleting negative comments or posting a sarcastic retort will only make matters worse. Never pass up an opportunity to find out what customers think, especially when it comes to a future product launch. Customers respond best when given a number of options. Post open-ended questions to get a dialogue started in the comments section, create polls and surveys for anonymous feedback or form focus groups using Google+Circles or Facebook Live Q&A. While it may seem counter intuitive, promoting your business too much can backfire. According to Social Media Today, just 20 percent of your posts should promote your brand and 80 percent should be other content. If you sell a line of protein supplements, for example, link to news articles about nutrition, share your favorite smoothie recipes and post photos of you and your protein-fueled kids crossing the finish line at your local 5K run. Social media doesn't work if you don't socialize. Growing your business requires connecting with like-minded individuals via private messaging, commenting, or sharing their content, not just pushing your own. If you aren't trying to find ways to add real value to the lives of your target audience, you could potentially be making a fatal social media mistake. One off-color remark or embarrassing photo can do a lot of damage when shared umpteen times. Every company needs a written code of conduct for its social media users. Profanity and racist or sexist language are clearly problematic, but you should also consider the values of your base. If your company sells vegan-friendly clothing, for example, avoid posting a selfie with a plate of chicken wings. By now, you're wondering how you can possibly devote the time necessary to launch a social media campaign effectively. The answer may be that you can't. Resist the temptation to enlist your tech-savvy teenage nephew or your already-swamped secretary and instead hire a professional. Look for an applicant with technological background, writing skills, marketing experience and entrepreneurial vision to take your startup's social media to the next level. Guest Authored By AJ Agrawal. AJ He is CEO and Co-Founder of Alumnify, an alumni-engagement platform. He's a Growth Marketer, Entrepreneur and Content Creator for Entrepreneur, Forbes, FastCompany and Fortune Magazine. Follow AJ on Twitter. 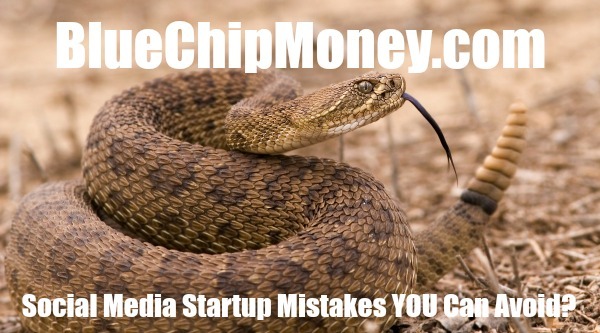 "15 mistakes startups make on social media that yours can easily sidestep..